"The Mystery of the End of Watch"
On The Mysteries of Laura Season 2 Episode 16, there's a high cost for the folks at the precinct when they arrest a drug kingpin and Jake makes a big decision. "The Mystery of the Unknown Caller"
On The Mysteries of Laura Season 2 Episode 15 Laura tries to stay a step ahead when her sister is a suspect in a murder investigation in Brooklyn. "The Mystery of the Political Operation"
On The Mysteries of Laura Season 2 Episode 14, Laura and Jake guard a foreign dignitary i and the job involves fending off protesters and death threats. 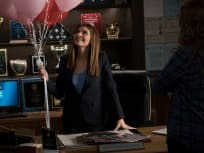 "The Mystery of the Dark Heart"
On The Mysteries of Laura Season 2 Episode 13, when Valentine's Day takes a deadly turn, a serial killer from the past is suspected of resurfacing. "The Mystery of the Morning Jog"
On The Mysteries of Laura Season 2 Episode 12, members of a men's rights group are suspects when the city's leading sports surgeon is killed. 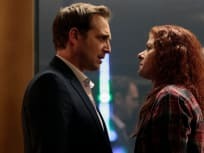 "The Mystery of the Unwelcome Houseguest"
On The Mysteries of Laura Season 2 Episode 11, Laura ends up having to fight to survive when the murder of a perfume mogul takes a shocking turn. "The Mystery of the Downward Spiral"
On The Mysteries of Laura Season 2 Episode 10, Laura and Jake are at odds over their relationship and no leads turn up in the murder of a perfume mogul. "The Mystery of the Triple Threat"
On The Mysteries of Laura Season 2 Episode 9, the team tracks a killer involved in an urban treasure hunt which leads them to rooftops and a lavish music hall. "The Mystery of the Ghost in the Machine"
On The Mysteries of Laura Season 2 Episode 8, the team is targeted when they investigate an undercover cop who is killed after being exposed. "The Mystery of the Maternal Instinct"
On The Mysteries of Laura Season 2 Episode 7, the team is surprised by an international smuggling ring when the body of a pregnant woman is discovered. I need to find a preschool for criminals. Permalink: I need to find a preschool for criminals. You were determined to get revenge and you did. Permalink: You were determined to get revenge and you did.